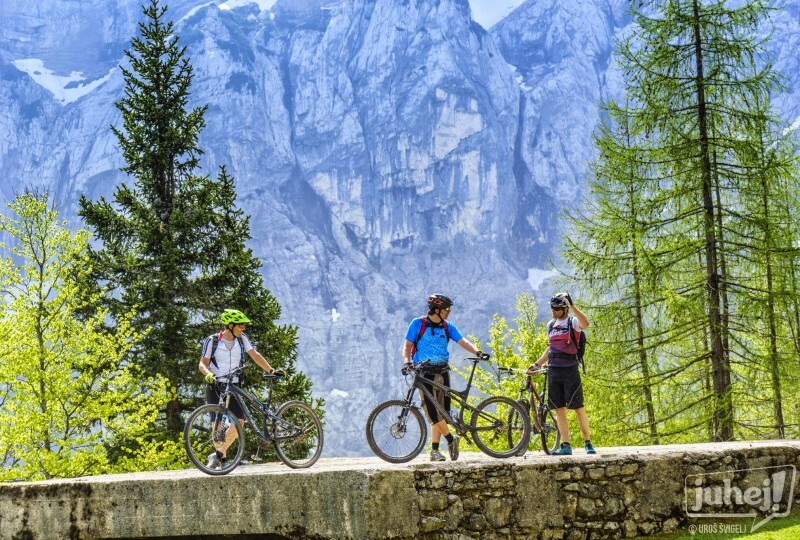 The Trans Slovenia 02 biking tour connects some of the most famous Slovenian tourist attractions, yet explores the most hidden and remote parts of the Slovenian hills and mountains. It runs by the famous Lake Bled after passing through one of the most beautiful alpine valleys of Radovna and by yet another alpine pearl, Lake Bohinj, and crossing the Pokljuka plateau with its dense forests and mountain pastures. 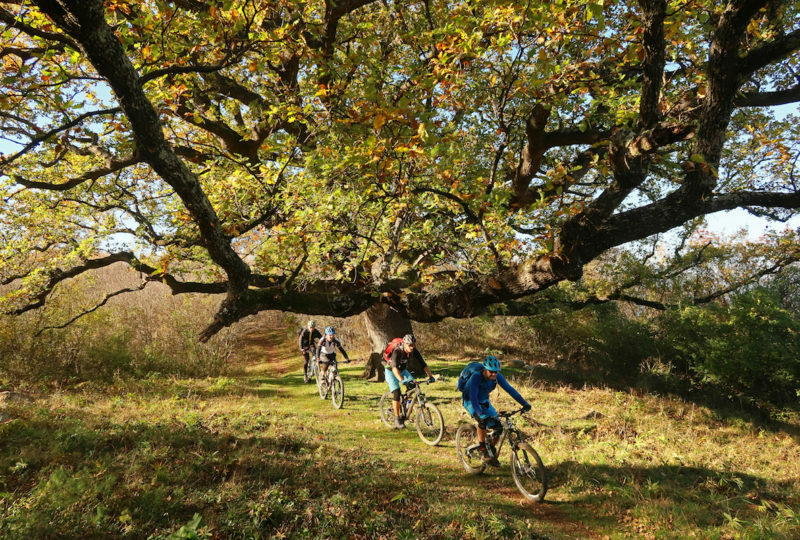 Two days of biking through secluded villages in the hills above Škofja Loka are marked by two UNESCO heritage sites, i.e. the Franja Partisan Hospital and the abandoned mercury mine in Idrija. Half way between the two sites lies the town of Cerkno, which is home to a world-famous jazz festival. 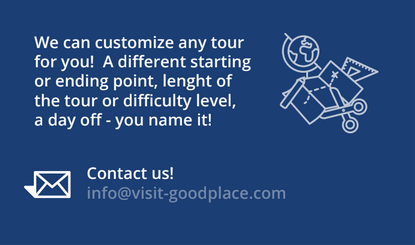 The second part of the tour leads through different wine regions. 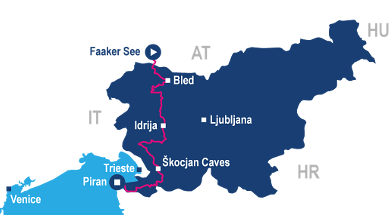 Starting in the Vipava valley, which is home to strong winds, it runs across the Karst region and finishes in Slovenian Istria. The tree climates and three types of terrain make the wines produced in each of the area different, even the ones that are made from the same grape types. Of course, all are worth tasting. 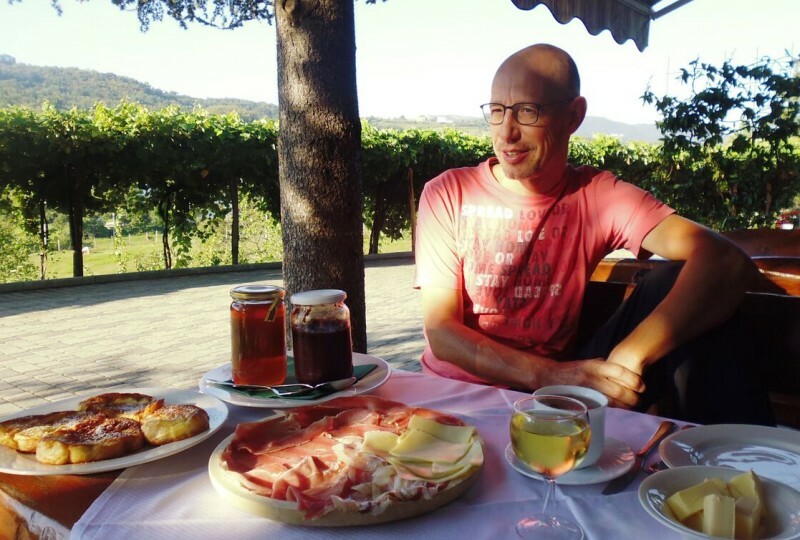 Those who would like to explore the fourth wine region in W Slovenia, are advised to book the Trans Slovenia 01 tour. The highlights of this part include a typical Karst town of Štanjel with its appealing narrow streets, the castle and the delightful garden, the UNESCO-listed, world-famous Škocjan Caves, Mt Slavnik with its stunning views, as well as the Sečovlje Salina Landscape Park with the Sečovlje Saltworks, which are the largest Slovenian salt evaporation pond and one of the rare facilities where salt is still produced in a traditional way. The final destination of the tour is the town of Piran, one of the most well preserved historical towns in the Adriatic and a gem of the Venetian Gothic architecture, which is full of atmospheric winding alleyways, sunsets and seafood restaurants. 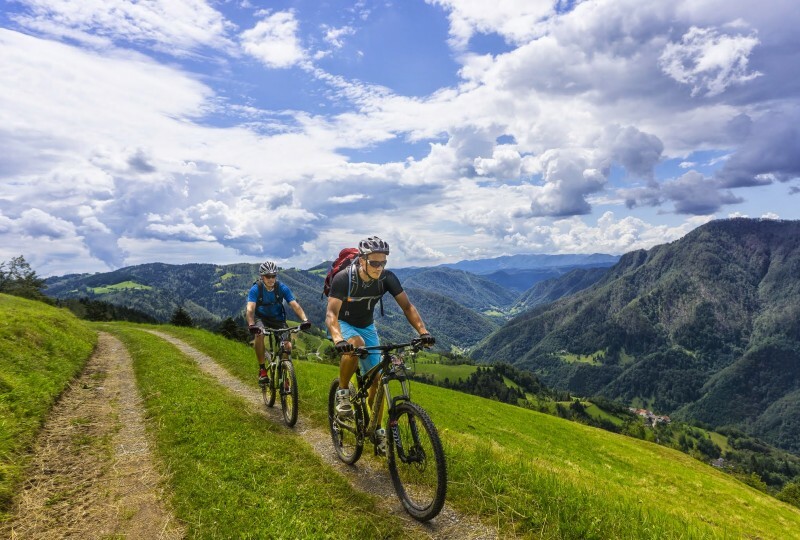 A week of great biking is guaranteed! This adventure is exceptional and exciting – an experience that is very different from everyday life. A step away from our normal and usual environment in order to discover something new that promises to be interesting , fascinating, and in which the outcome is uncertain – as a general definition. However, bikers can use a shorter formula: Trans-Slovenia. By Uli Stanciu, pioneer of Bike magazine, Trans Alps tourism, BIKE Festivals Riva del Garda and Willingen and owner of www.bike-gps.com. 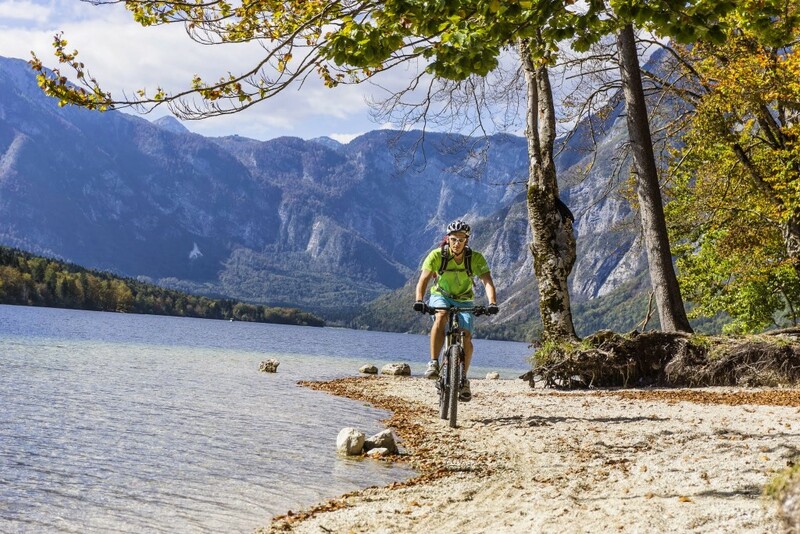 The first stage of the Trans Slovenia 02 biking tour starts near the Faaker See lake in Austria and heads on to Lake Bled, the most famous tourist attraction in Slovenia. Initially, the road leading from Faaker See is concrete, and it turns into a gravel/forest road halfway to the Jepca mountain pass, which offers magnificent views over Austria and Slovenia. 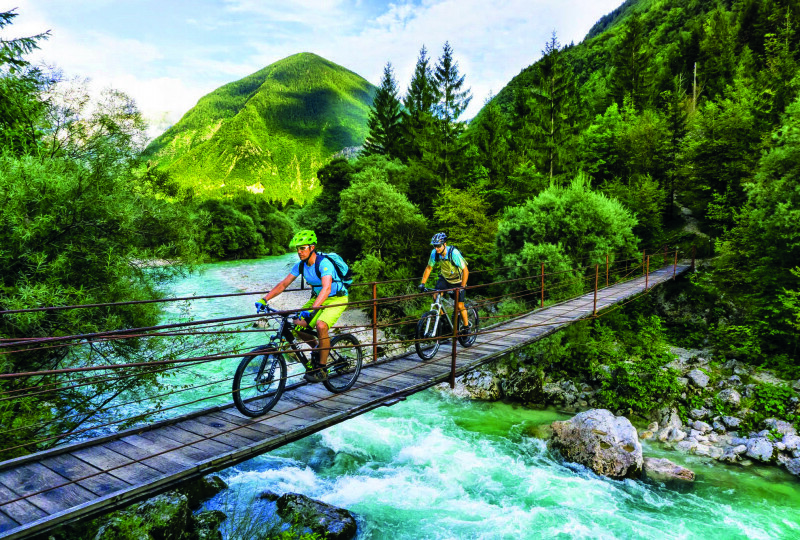 From there, a pleasant forest road leads from to the alpine village of Mojstrana, where the tour enters what is arguably one of the most beautiful alpine valleys in Slovenia, the Radovna river valley. Since the area is part of the Triglav National Park, mass tourism is partially limited here. The valley is very popular due to its beautiful unspoiled nature, with one of the most imposing parts of the valley being the 1.6 km long Vintgar gorge. Reaching the final destination of the day, it would be a pity not to visit the famous island in the middle of Lake Bled, featuring a church, or taste the famous Bled cake. The second day the tour includes a climb to the Pokljuka plateau, which overlooks both lakes. Located in the Triglav National Park, the Pokljuka plateau measures some 20 km in length and almost the same in width, resting at an altitude of 1300 m. The plateau serves as a starting point to many hikes, and numerous old bear migration routes lead through the forests and over the plateau that is dotted with hidden shafts, sinkholes and small valleys. Shingle-covered wooden cottages are typical of the Slovenian mountain pastures. Back in the old days, they were used as homes for shepherds and as dairy production facilities. The highlight of the day is the Zajamniki mountain pasture in the central area of Pokljuka, with its beautiful cottages and a perfect view over Lake Bohinj. In wintertime, Pokljuka serves as one of the world’s best biathlon centres. 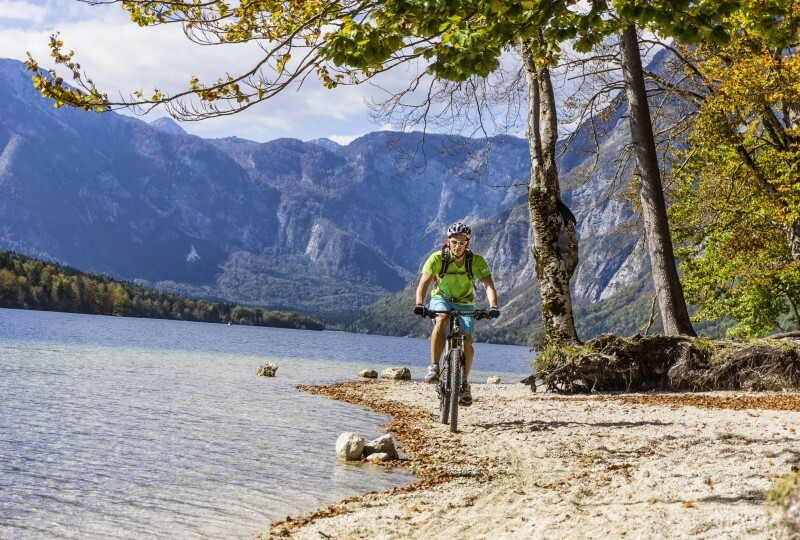 Using mostly forest roads, the tour reaches Bohinj, the final destination of the day. Many visitors to Slovenia say they have never seen a lake more beautiful than Bled – until they see Lake Bohinj, the largest natural lake in Slovenia, which is located in a glacial valley just 26 km southwest from Bled. The day starts with a pleasant climb offering great views of Mt Triglav, the highest peak in Slovenia, from where a trail leads to the Soriška planina mountain pasture. There is an option to take a concrete road to the top of Soriška planina and descend to the small village of Petrovo brdo, but the really exciting thing to do is to go around the pasture and reach the same village after a wild ride over gravel and forest paths, taking some of the pleasant single trails along the way. 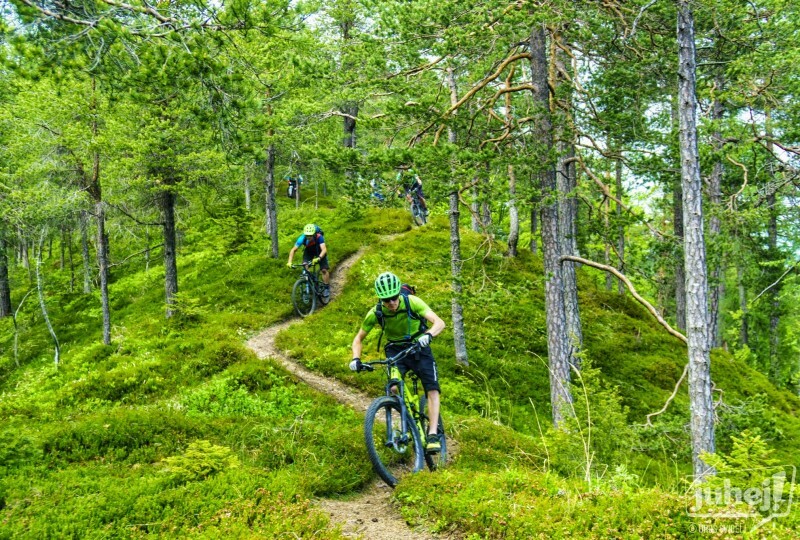 Day 3 is all about biking, as there are almost no landmarks on the route and the whole day is spent on or passing by remote trails, villages and farms. Even the only landmark, which can be found right at the end of the route, is famous for its covertness. The WWII Franja Partisan Hospital, a cultural monument of national importance, has been placed on the UNESCO Tentative List of World Heritage. Due to its symbolic value and role in the European history and culture, the Franja Partisan hospital received the European heritage label in 2015. There is an alternate route leading to the hospital before reaching the small town of Cerkno, which, albeit small, is an important site as it features a modern ski centre above the town and hosts the world-famous Cerkno Jazz Festival. The tour continues in the same mood as the previous day, with the remote, narrow gravel and concrete roads winding up and down the steep hills and along scattered villages, offering stunning views along the way. The destination of the day is a small town of Idrija, which is notable for its mercury mine featuring interesting stores and infrastructure as well as the miners’ living quarters and a miners’ theatre. Since the route is a bit shorter than the ones taken on other days, there should be enough time left for the group members to visit the mine, which has been on the UNESCO World Heritage Sites list since 2012. Day 5 continues with exploring roads and locations that are barely known even to the average Slovenian weekender. En route, the landscape changes from Alpine to Dinaric. 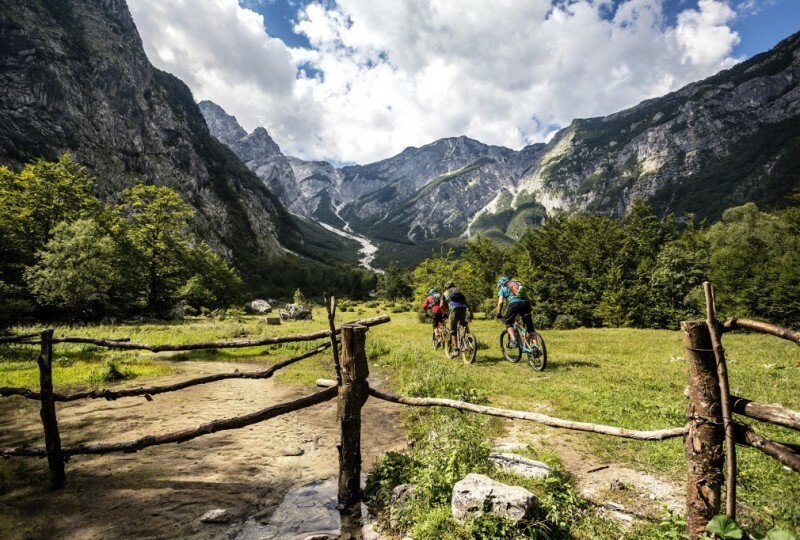 The tour starts with a pleasant, easy ascent to the small town of Črni Vrh situated between Idrija and Ajdovščina, continues to Mt Javornik and descends through the Bella valley to the town of Vipava. The fertile, wine-rich Vipava valley stretches from Nova Gorica into the Karst region. Its mild climate encourages the cultivation of stone fruits, such as peaches and apricots. The idyllic rural scenery offers plenty opportunities to try some of the outstanding gourmet treats. The Vipava valley is a typical location in the Dinaric region just several kilometres from the final destination of the day – the town of Ajdovščina. In certain weather, the famous Bora wind in the valley can reach up to 200 km per hour. However, you need not worry as the group will take a detour if the weather so dictates. Day 6 could be called the wine roads day. Once again, there is a huge change in the landscape, as the tour leaves the Dinaric valley and enters the Karst region. Still, both terrains are dotted with numerous of vineyards. The Slovenian Karst is the wine-growing region, which was praised even by the ancient Greeks and Romans. The Karst Wine Route boasts more than 100 wine cellars, where visitors can taste and explore the wealth of Karst wines. Did you know that Slovenia is literally the land of karst? It was the Slovenian Karst that lent the name to the karst landscapes and phenomena all over the world, for it was here that scientists were first able to explain the numerous karst features. Speleologists discover new caves in Slovenia every year, and the number of recorded ones now amounts to more than 8000. However, only about 20 of them are show caves. The highlight of the day is a typical Karst town of Štanjel with its appealing narrow streets, the castle and a delightful garden, and many other similar sights await on the road to the final destination of the day, the town of Divača. The day starts at another UNESCO site, the world famous Škocjan Caves with the educational trail offering wonderful views of the deep collapse dolines, steep walls, the disappearing Reka river and the surrounding hills. However, the highlight of the day is Mt Slavnik with its fabulous views over the sea and the other Slovenian regions. 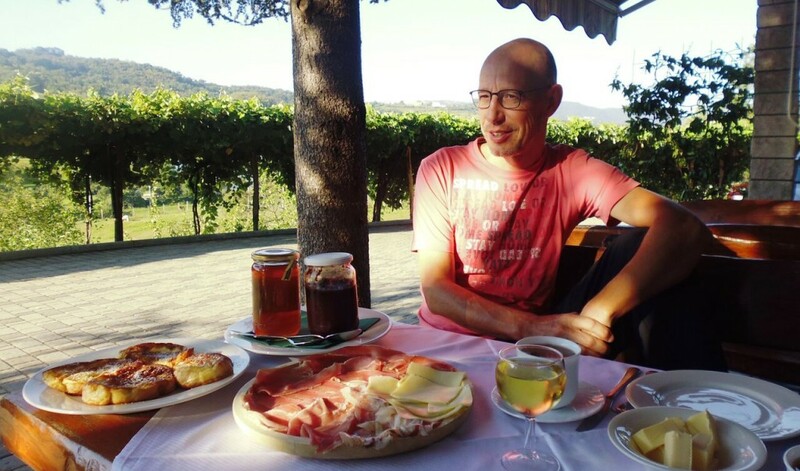 From there, concrete and gravel roads take the tour through the Tuscany-like Istrian land full of typical villages and more vineyards to the village of Marezige, which is well known for its producers of two typical local grapes – Malvasia and Refosco. Day 8 is about relatively easy biking, since there are no hills to climb. The route leads from the Dragonja valley to the sea, where it passes the Sečovlje Salina Landscape Park featuring the Sečovlje Saltworks, which is the largest Slovenian salt evaporation pond and one of the few facilities where salt is still produced in a traditional way as well as a wetland of international importance and a breeding place for water birds. The saltworks have been in operation since the 13th century, with the salt production having continued to this day in order to preserve the natural and cultural heritage. The road then goes along the Slovenian coast through the city of Portorož to the final destination – a small boutique town of Piran, which is a slice of Venice in Slovenia. Sitting pretty at the tip of a narrow peninsula, the picturesque Piran is the most popular site on the Slovenian coast. The old town, which is one of the best-preserved historical towns in the Adriatic, is a gem of the Venetian Gothic architecture. It is hard not to fall in love with its atmospheric winding alleyways, sunsets and seafood restaurants. There is enough time left to enjoy the impressive atmosphere of the old town. Before a transfer back to the starting point on the next day, we would suggest to enjoy a cup of coffee at the Tartini Square that features a monument dedicated to the great violinist and composer Giuseppe Tartini, who was born in Piran in 1692. Rates are valid per person, based on double occupancy.Rates for the pre-scheduled dates are based on group planning (6 pax). The adventure starts at the Faaker See (near Villach, Austria or at Bled and ends in the town of Piran on the Slovenian coast. Seven international airports, those of Ljubljana, Venice, Treviso, Trieste, Klagenfurt, Graz and Vienna, are located within the 150-minute drive from Villach/Bled. An airport shuttle from and to any of the seven airports can be arranged.